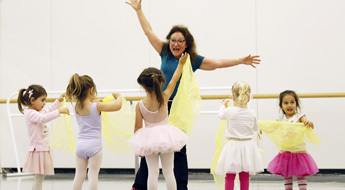 Canada’s National Ballet School provides classes for children, youth and adults on its campus in Toronto. Using the same pedagogy developed for its Professional Ballet Program, dance students may develop skill and artistry as they progress through the structured levels in each program. The Associates Program allows boys & girls (ages 6 to 17) in the Greater Toronto Area to participate in afterschool & weekend dance classes from mid-September to early June. The Adult Ballet Program offers seven progressive levels designed to appropriately accomodate students while allowing for individual advancement at their own pace throughout the year. No previous dance training is required. Come dance with us! These classes, created specifically for people with Parkinson's Disease, are designed to be physically, cognitively, and creatively stimulating and incorporate a variety of different musical and dance styles. Click to learn more about Sharing Dance Parkinson's classes at NBS.